Creamy, delicious Lemon Cheesecake has the perfect consistency and is topped with a homemade Lemon curd! Some people celebrate Christmas, Elvis’ birthday, anniversaries. But I also enjoy celebrating food holidays. And today, being National Cheesecake Day, is one of my favorites! As you may recall, I’ve been working with PHILADELPHIA Cream Cheese this year to create some delicious recipes using their product. When they asked if I could create a dessert for National Cheesecake Day, well, it only seemed fitting I go with a lemon flavored treat. Several years ago we had a house sitter who would leave us cheesecakes in the refrigerator when we would return home from vacations. I mean seriously, do you know how exciting it was to return home to a freshly baked cheesecake? He made some great flavors. When he moved, he gave me his basic recipes for some of these cheesecakes. Today, I tweaked one of his base recipes and added some homemade lemon curd on top. I also used a chocolate cookie crust instead of a graham cracker crust, just to add a little extra decadence. It is a holiday after all! I know many people get afraid when it’s time to make a cheesecake. They think it’s going to be hard. Just like I’m afraid to make macarons. I know, silly right? Line the bottom and sides of your springform pan with foil. This is VERY important. Because we are going to bake our cheesecakes in a water bath, you don’t want that water seeping into your cheesecake. Cut a big piece of foil and wrap the bottom of your pan (ON THE OUTSIDE). If I’m feeling paranoid, I’ll double layer the foil. Use PHILADELPHIA Cream Cheese for your filling. Seriously people, you want the creamiest cheesecake? Using a product that is made from fresh local milk (from farm to fridge in just 6 days) and real wholesome cream creates the best cheesecake. It’s a no brainer. Once you make your cheesecake crust and add your filling, place your pan into a water bath. I use my broiler pan. I place my cheesecake into the pan, then add enough water to go up the sides of the springform pan about 1 inch. If you’re scared of this step, just put your broiler pan of water on the lowest rack instead. Bake cheesecake according to directions. When it’s done baking, DON’T open the oven. Just turn the oven off and leave your cheesecake in there for about 45 minutes. This helps cut down on those cracks on top of your cheesecake! Remove cheesecake from oven after 45 minutes and allow to set in refrigerator. I prefer to give it at least 6-8 hours, but I’ve eaten it as quickly as 4 hours. Add your lemon curd and slice and serve. (for nice clean slices, run knife in hot water and wipe with paper towel after each slice). If your cheesecake cracked…don’t worry! You’ll be topping it with lemon curd. You can also try this VANILLA Cheesecake recipe topped with whipped cream and fresh berries. A few of my favorite tricks for Cheesecake Baking. Today’s recipe uses one fresh lemon, zested into the cheesecake filling and some homemade Lemon Curd on top. It adds a touch of sweetness from the citrus curd. You can make your own using this recipe, or buy a jar at the store. And don’t forget to stock up on some PHILADELPHIA Cream Cheese. Prepare 9inch springform pan by wrapping entire bottom, and partially up the sides with foil (the OUTSIDE of the pan, no inside). Set aside. To make crust, blend cookies in food processor until fine Incorporate melted butter until even. Press crust into bottom of a 9inch springform pan. Freeze while you make the filling. For the filling, beat cream cheese, lemon zest, sugar, cornstarch, sour cream and vanilla. Slowly add cooled white chocolate mixtures. Finally, add eggs, one at a time until mixture is smooth. Pour into prepared crust and place cheesecake pan into a large baking dish (I use a roasting pan). Fill dish with hot water to about 1-2 inches up sides of cheesecake pan. Bake 60 minutes in a 350 degree oven. Turn off oven and let sit undisturbed for about 45 minutes. Remove and allow to cool in refrigerator about 6-8 hours (or overnight). Top with prepared lemon curd, slice and enjoy! Lemon curd on a cheesecake? Is there really much that could be better than that! Nope. there is not. This looks fab girl! Pinned! Thanks for pinning Taylor. And in my opinion, lemon is just the bomb. Congrats on being an ambassador! Thanks Averie!! Some cheesecakes slice much easier than others 🙂 Everything about this one turned out perfect! This is my favorite holiday, second only to chocolate chip cookie day! Aimee, this cheesecake looks phenomenal. Good detailed instructions, too! Oh chocolate chip cookie day. That’s a good one too!! I love the chocolate crust! Yeah, not the norm for a lemon cheesecake, but oh my word was it good! Best holiday ever!! And I love the idea of a lemon cheesecake; so fun and summery! Omg, I bet this is amazing! I’m loving the lemon curd on top. I can eat that with a spoon! How awesome that your house sitter would leave you cheesecake! I know right? Made us want to go out of town more often!!! I think I could eat the entire jar of that lemon curd smeared on top of that cheesecake! YUM! Fortunately my lemon curd recipes makes two cups of curd. So I had a little extra for spooning into my mouth!! I made recently a lemon cheesecake but yours looks over the top amazing! Love the white chocolate addition and the lemon curd on top! Thanks for joining us Aimee! I learned from the best! I guess I should have mentioned he was a pastry chef. LOL. Stunning! I love lemon anything — I need this cheesecake in my life! Sweet and simple….totally the way to go. Love lemon lately! Thanks Melanie, it was all I could think to make for this holiday! This cheesecake looks amazing Aimee! Love the lemon flavor! The lemon curd topping brings this over the top. Looks amazing! That’s my new motto: Lemon Curd makes everything better!!! That looks fabulous! I love the extra lemon on top! Thanks Tonia 🙂 Nothing wrong with extra lemon in my book!! Oh my gosh. A chocolate crust on a lemon cheesecake. I LOVE YOU! What a gorgeous cheesecake! Love the lemon curd on top! Thanks Jessica!! It’s a perfect topping in my book! Light and sweet! I adore anything with lemon. This looks spectacular!! Thanks for the detailed steps and hints, Aimee! I’ve never made a cheesecake and these seem really helpful. I love how you chose to pair chocolate with lemon! Pinned so I can make this delicious cheesecake later. I love lemon, and seeing the layer of lemon curd is actually making me mouth water:) Delicious! *That should be, MY mouth water…I sound like a pirate in the first comment, haha! 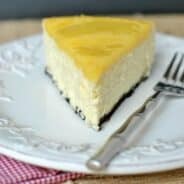 I know that lemon cheesecake can be amazing! But your addition of the lemon curd takes it to a whole new level, Aimee! LOVE it! Whoa, that lemon curd topping is a fabulous touch! Double lemon = Double delicious!!! I love anything lemon, but especially lemon cheesecake! Pinned. I need this in my life. I love lemon desserts and just want to eat my screen right now! Lemon cheesecake is one of my all time favorites!! 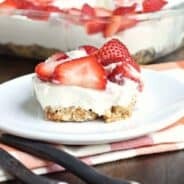 This one looks fabulous and I appreciate all your tips, cheesecake can be tricky if you aren’t careful! This cheesecake needs to happen for me!! Like really!!! LOVE this cheesecake, Aimee! And you are totally right, Philadelphia makes for the best cheesecakes. Seriously, I had a cheesecake recipe fail before my Philadelphia success, and it was TOTALLY because of the cream cheese I used. Pinning this! I’ve learned the hard way too Lisa! Such a waste of ingredients when it fails. Never again 🙂 Thanks for pinning! A brand ambassador for Philadelphia Cream Cheese – that’s amazing! All cheesecake, all the time!! Your lemon cheesecake looks so creamy and delicious. 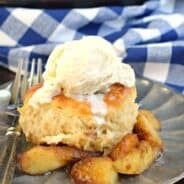 I have to make this for my husband – he loves lemon desserts! Pinning this! Happy Cheesecake Day! I miss sitting at that house. It was always like a mini vacation. And this recipe looks amazing. Keeping the white chocolate in with the lemon? Sounds amazing. I’ve also messed with my base by adding a salted dark chocolate ganache on top. Oh, and salted dark chocolate ganache? Seriously? I love you. 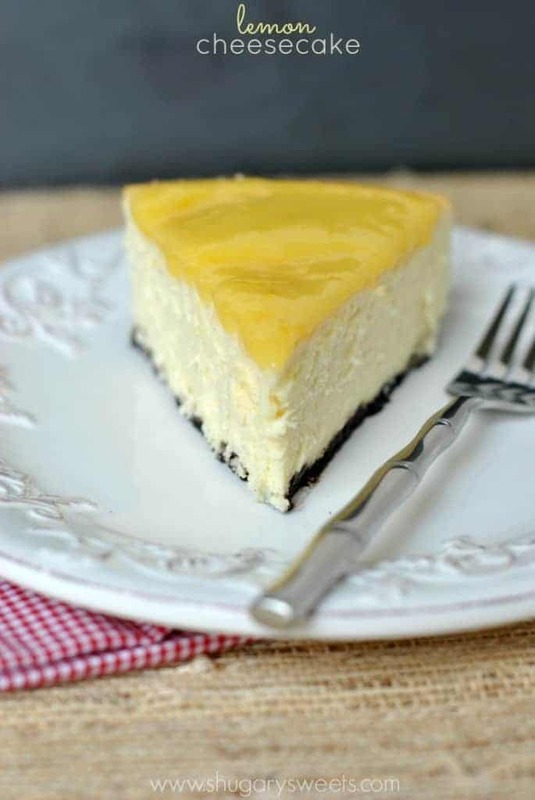 This lemon cheesecake screams summer… It looks so refreshing and tasty! Wow! Lemon curd on top! So creative! I just finished my first baked cheesecake this weekend and now I totally want to try more recipe! First off this looks amazing. Second can I borrow your house sitter? It looks like cheesecake perfection. I want a house sitter like that. That is the best housesitter ever. Cheesecakes? Always. Especially when lemon and white chocolate are involved! <3 that lemon curd! Lemon curd is the BOMB!! I LOVE THIS CHEESECAKE!! Why am I yelling? Oh that’s right, it’s cheesecake and I’m excited. Oh man that homemade lemon curd of yours is DIVINE (one of my favorites ever!) and I can only imagine how it complements this cheesecake. Happy Cheesecake Day Indeed! Though I may just make this to enjoy for Happy “Fall is terribly stressful at work and full of students and I need Cheesecake” Day. What a gorgeous looking cheesecake!!! Love that extra layer of lemon on top! Definitely refreshing and perfect for summer time!!! Many thanks! That was great so easy to cook. What a fabulous cheesecake!! I love your cheesecake tips – I’ve definitely followed them to a T before for a perfect cheesecake! That is a gorgeous cheesecake, love lemon in the summer!! So, I’ll bake you a cheesecake, you make me macarons. K? Aimee, this cheesecake is perfection! and hello. . I always use Philadelphia cream cheese. . is there really any other brand?! Thank you so much for pinning Kelly!! Ooh, if only I’d seen this before I used up my lemon curd! Still, one can never have enough curd around the house. 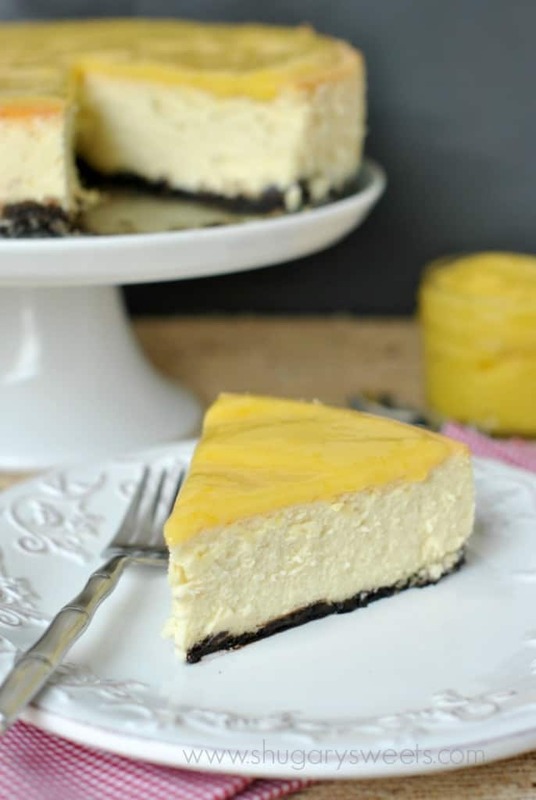 I always love a light balance to the intensity of cheesecake–this recipe has me so excited. Thanks for sharing it, Aimee! Awesome to celebrate with you! I love the lemon combo on the cheesecake! It looks so great! I’m loving this Aimee! Lemon is the best. And thanks for the tips on the water bath–I make cheesecake all the time but I just accept the cracks and make peace with it, haha. Because water baths are scary. But maybe I’ll try it next time! Absolutely heavenly Aimee! I’m pulling up a chair with a fork in hand. Serve me up! This cheesecake looks completely divine! I could live on lemon desserts! Is there a substitute for the white chocolate or can I leave it out completely? 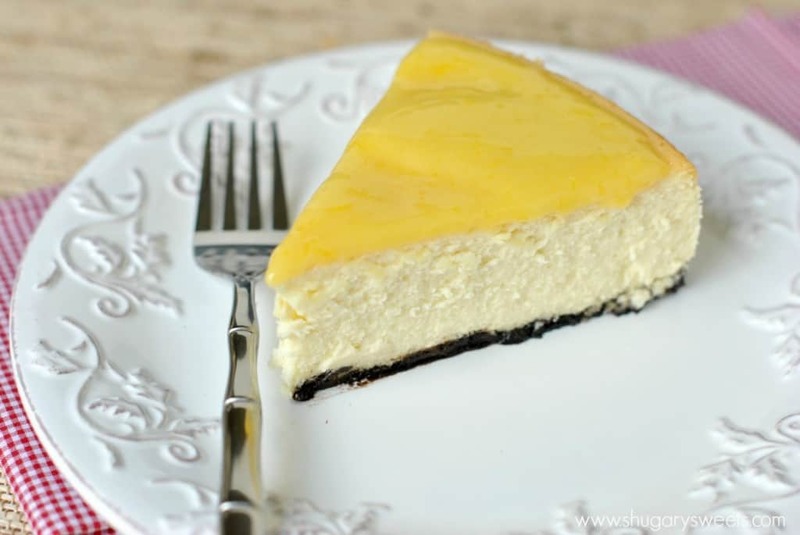 It definitely adds a creaminess and richness to the cheesecake! 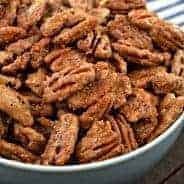 I haven’t tried this recipe without it, but if you do, let me know how it works out for you! this recipe looks devine. Would I be able to use Splenda or another sugar substitute and omit the white chocolate?